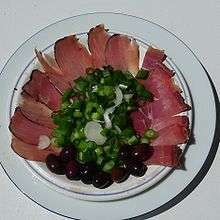 Cured pork tenderloin is found in various cuisines in Mediterranean Europe and South America. It is typically salted or brined then dried or smoked. In Spanish cuisine, lomo embuchado is a dry-cured meat made from a pork tenderloin, sometimes called lomo for short. It is similar to cecina, but with pork instead of beef. 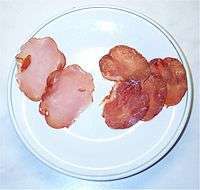 In Italian cuisine, there are many variants of lonza stagionata. Capocolla is very similar, but made from the neck muscle rather than the tenderloin, and often stuffed into a casing. In Corsican cuisine, lonzu is cured loin. In Cypriot cuisine, lountza (Greek: λούντζα) is brined, marinated in red wine, dried, and smoked. It may be sold immediately after smoking, or aged. As it ages, it becomes harder and more strongly flavored. It may be spiced with coriander. Lountza may be served cooked or uncooked with alcoholic drinks such as zivania or wine. Grilled lountza served with other Cypriot foods such as halloumi and kefalotyri cheese often appears in meze platters. Sandwiches made out of grilled lountza and halloumi are favorite fast food snacks in Cyprus. In Mykonos, Greece, louza is preserved pork loin. All of the names above come directly or indirectly from Latin lumbus 'loin'. 1 2 Yangkou, Varvara. "Λούντζα". foodmuseum.cs.ucy.ac.cy (in Greek). Cyprus Food Virtual Museum. Retrieved 24 November 2015. ↑ "Local Products". mykonos.gr. Mykonos. Retrieved 25 November 2015.